Citicus ICS is a special implementation of our award-winning web-based Citicus ONE software that is optimized for measuring and managing risks to industrial control systems (ICS). These include supervisory control and data acquisition (SCADA) systems, distributed control systems (DCS) and other technologies used to automate industrial processes, eg using programmable logic controllers (PLC) and remote telemetry units (RTU). Industrial control systems are essentially IT systems and risks can be evaluated and managed using the same basic approaches used for other IT environments. However, these real-time systems have particular characteristics that need to be taken into account so that the risk management process is viable and optimized for the industrial control system environment. 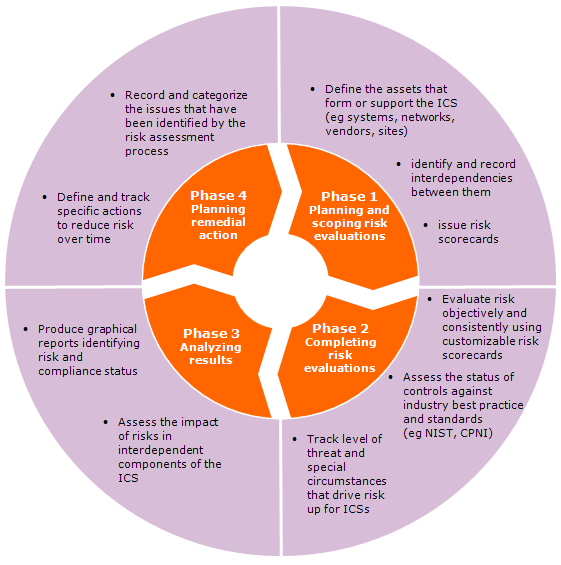 Citicus ICS supports a complete risk management lifecycle that follows a four-phase Plan-Do-Check-Act process as illustrated below. The potential impact of ICS incidents leading to a loss of availability of the process control capability, integrity of control data or confidentiality of information. Availability disruption can be measured on a scale from milliseconds to days or longer, depending on the nature of the controlled process. The status of controls measured against a library of industry best practice controls drawn from many sources such as CPNI Good Practice Guides to process control and SCADA security and NIST 800-82. Organizations can use the Citicus-supplied control framework off-the-shelf or augment/replace it with their own set of controls. Particular characteristics of the ICS that can drive risk up, such as high degree of change, complexity, interconnection to other systems, accessibility by external parties. An indicator of incident probability through metrics of past incidents such as malfunctions, human error, malicious action, disruption from environmental events. The actual business harm caused by previous ICS incidents, if any. Harm is measured in an objective and consistent way and covers all types of business impact such as financial loss, reputational damage, environmental and safety impacts. Completion of a Citicus ICS risk scorecard provides an assessment of the status of risk that can be displayed graphically as shown below. Other reports that can be generated from Citicus ICS identifying different aspects of risk and compliance can be seen in the Example results section. The information presented in these results enable you to build risk treatment plans that can be costed, prioritized and assigned to individuals. These plans can be managed within Citicus ICS and used as an input into the next risk assessment cycle.